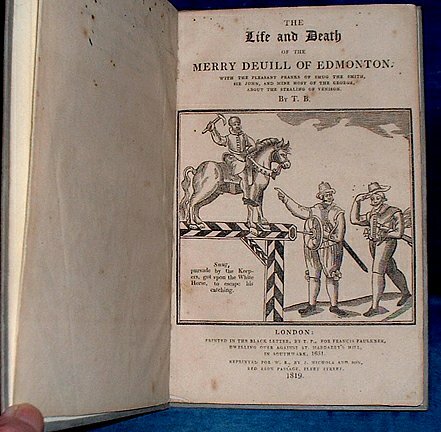 Title: THE LIFE AND DEATH OF THE MERRY DEVILL OF EDMONTON. With the pleasant pranks of Smug the Smith, Sir John, and Mine host of the George, about the stealing of venison. By T.B. printed in black letter by T.P for Francis Faulkner .. in Southwark, 1631. Description: London, Reprinted for W.R. [William Robinson] by J. Nichols and Son 1819 Larger than half page woodcut to titlepage + country contentments scene to first page + a head- and tail-piece. . Octavo later neat grey boards with spine title (tips sl.worn) iv +52pp. MS note from Gentleman's Magazine June 1820 p44 and August 1848 p211 attributing the republishing of this original 1631 humourous tale of a Tyll Owlglasse like hero to the London historian William Robinson. Light edge dusting but neat wide-margined copy, no tears, no marking.